Chinese Consumers Show No Sign of Slowing! • And a surge in inventories of unsold homes to the highest level in history! Mike Larson, quoted in the AP lead story last night , says "we're swimming in home inventories" — not exactly a good sign for home prices. And he tells us "yesterday's dismal housing report doesn't even reflect the impact of the mortgage meltdown that really started hitting the housing market AFTER most of these numbers were collected." And this is why, today, I want to tell you about a very large group of people who couldn't care less about our woes — Chinese consumers. I'm not trying to rub it in, mind you. Rather, I want to show you why Chinese consumption will lead to massive profits for plenty of public companies … no matter what happens here in the U.S. It's six o'clock in the morning and we're already awake. We didn't need an alarm clock to get us up, either. It's simply impossible to escape the early morning sounds of frantic construction outside the hotel window. A common joke is that the construction crane is the national bird of China. 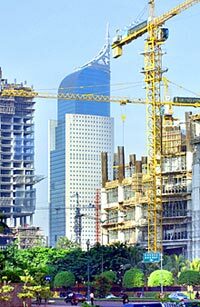 Some reports estimate that 50% to 75% of the world's construction cranes are currently in the country. After a few trips, you'll believe it because the Chinese skyline is constantly changing. After enjoying a traditional Chinese breakfast of rice congee — a watery rice porridge — along with a deep fried devil or cruller — twisted strips of deep-fried dough twelve inches long — we head out. It's hard to walk anywhere without passing a Starbucks. 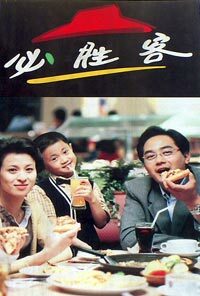 See, Chinese yuppies love everything Western, including our most famous coffee shop. 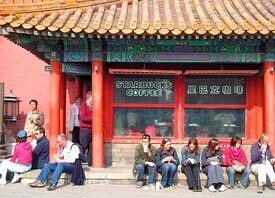 The big difference is that Chinese Starbucks are most crowded in the evening. Instead of a movie or cocktails, Starbucks has become the place for young Chinese to gather and socialize. As we stop and talk to people in the streets, we mention the latest happenings back in the United States. They have a hard time understanding why Americans, despite all their wealth, are having so much trouble with their mortgages. The main reason: Chinese citizens often pay cash for all their major purchases. Cash is just part of the culture … even today, many workers receive fat envelopes of cash instead of paychecks. Consider this: A whopping 83% of Chinese homebuyers paid cash for their homes. That may sound impossible to an American, but you have to remember that in Asia savings rates approach 25% and children live at home until they can buy their first house. Thus, even though real estate is falling in California, Florida, and Nevada, Chinese real estate buyers aren't worried. Asian real estate development companies like E-Home, and construction equipment makers like Komatsu, are racking up huge profits. As you look around, you might also notice that many of the high-rise condominiums dotting the Shanghai skyline are missing something — many are not wired for fixed-line telephones. Reason: Mobile phones are so ubiquitous in China that millions of people don't even bother to install land lines. Heck, China Mobile has more mobile phone customers than the U.S. has citizens! No wonder the company's stock just hit a new all-time high on Friday. My Asia Stock Alert subscribers are sitting on an open gain that exceeds 120%! After walking all morning, we're hungry. It's definitely time for lunch. Too bad lines of Chuppies are already spilling out of the Pizza Hut and KFC restaurants we come across (both chains are owned by Yum Brands). We watch people grabbing slices of sea eel pizza. I know it will never hit the top of the U.S. sales charts, but it's one of the most popular pizza toppings here in Shanghai! Sea eel is a popular topping at Chinese Pizza Huts! Most of the diners are filled with free-spending Chuppies known as "little emperors." In other words, they're the sole children, and they've been spoiled with an overblown sense of self-importance and entitlement. They often live at home, which means they have large disposable incomes to spend. It explains the almost endless stream of customers piling into the Shanghai location stores of Louis Vuitton, Harry Winston, L'Oreal, Tiffany's, and Coach! The crowds are so thick that security guards have been hired just to keep the stores from getting overrun. And inside, enough money is being spent to make even Paris Hilton blush. If they're not shopping, Chinese teens and twenty-somethings go to one of hundreds of the gaming parlors in Shanghai. There they play online games from Netease and The9Ltd. Listen to this — online gaming is so popular in China that the government passed a law limiting online gaming time to four hours a day. Of course, ingenious Chinese nerds quickly found ways to circumvent those rules. The more ambitious Chuppies skip the games and attend New Oriental Education's night schools, where they can improve their English skills or prepare for a college entrance exam. By the way, while we're touring their country, Chinese citizens are planning vacations of their own through companies like online travel agency Ctrip.com. One of the most popular destinations? Macau, the Las Vegas of Asia. The Chinese look forward to gambling at the glittering Las Vegas Sands or Macau Wynn. See, most Chinese citizens are just too busy working and enjoying their newfound wealth to worry about us. And economic conditions in their country couldn't be better. That's exactly why the Shanghai Composite Index hit 5,000 for the first time last week. The prosperity has spilled over to the Hong Kong stock market, too. The Hang Seng index has risen 620 points (2.77%) to 22,966.97 since last week's column when I loudly told you that Hong Kong was ready to take off. Another thing I'd like to note is that many of the companies I mentioned today are traded right here on U.S. exchanges. So even if you don't want to venture too far away from your regular brokerage account, you're not limited to just buying American companies. Look, I've been studying Asian investments for some time. I've been traveling there even longer. And this is the first time that I've considered the downside risk to be greater for U.S. investments than those in Asia. So by remaining 100% invested in U.S. companies, you're not just missing out on many of the fastest-growing companies in the world, you're also risking the chance that our country's ongoing credit crunch could pull our economy (and your portfolio) down with it.